* Mariell's lovely Freshwater Pearl and Crystal Wedding Bracelet adds a beautiful vintage touch to your wedding, bridesmaids or prom dress. * Our adj. 7" - 9" Bracelet is 1" h and the pave design is 4" across. * We have a captivating matching neck set 4060S. * Mariell's top-selling Freshwater Pearl and Crystal Wedding Bracelet is a must-have addition to your store's Jewelry showcase. * This Pave Crystal and Freshwater Pearl bracelet is available an attractive low wholesale price for a romantic Vintage accessory that will suit all budgets. 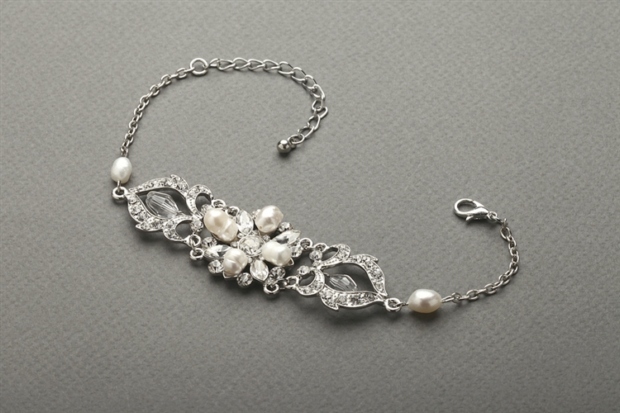 * For weddings at a Victorian Inn or on a tropical island beach, this versatile bracelet will make an alluring fashion statement. * This timeless treasure can be worn even after the special day as a great accessory for "Girls Night Out" or a Saturday evening dinner party. * Mariell offers a ravishing matched Necklace and Earrings set (sold separately) as style 4060S.